H&M Whiteout | Light Your Nails! Today I’m showing you a nail polish that I literally am crazy for: H&M Whiteout. Total white nails are not for everyone, I know. I have always loved them though. I remember in my early teenage years owning 5 or 6 nail polish bottles, which were a whole lot back at the time. One of them was a chalky white Maybelline that I used so often. This love for white nails never ceased, not even now after so long. The problem with white nail polish is their formula. Whites are usually either thick and patchy, or too watery and not opaque. That goes for pastel shades, too. H&M Whiteout is neither. Its formula is literally perfect and just the same as any other shade out there. It’s easy to paint, it has the right consistency. It’s quite opaque, although it needs two coats for an even coverage. It dries glossy but using a top coat makes it even better. Drying time is average, not super quick but neither too slow. What can I say? H&M Whiteout is officially my new favourite white creme. And I must add H&M is the best drugstore brand out there at the moment in my opinion. Since they released the new beauty range, whose bottles are the ones in the photos, they really nailed it. I swatched all the new shades I own and all of them were perfect. White was the last and thoughest one and it proved fantastic, too. Thumbs up! Have you tested any new H&M nail polish yet? Did you love them as much as I did? 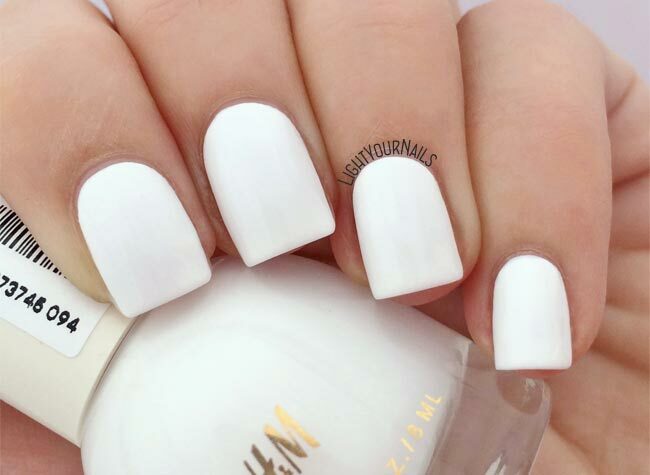 And what about total white nails? Any favourites? It's a neat and perfect looking white nail polish! Thumbs up for the great formula! I agree Andrea! Thanks for your comment! Vero, le unghie bianche sono delicate per lavorare!